Up for sale is this vintage Warn 5687 winch. Period specific to 1971, as it was pulled from a 1971 Toyota Land Cruiser FJ40. Works but will need a couple gaskets replaced, which can be ordered. Wire spool also a bit bound up and will need some finessing to loosen. Includes all parts needed for installation including controller, which bolts up nicely under the steering arm inside the truck or can be slotted separately within the vehicle in three separate locations, if desired. Cables for attaching to battery also included. 1977 Toyota Land Cruiser FJ40 For Sale – Meticulous Resto-Mod Restoration and more than $100k spent with receipts to prove it! SOLD at Barrett Jackson auction! This stunning 1977 FJ40 was originally purchased at a Barrett-Jackson auction and the new owner had Red Line Land Cruisers of Colorado Springs work to restore and tastefully modify this FJ. A frame-off restoration was performed BEFORE the added modifications/new restoration was completed, so this Cruiser has been restored twice-over to meet the exacting specifications of the new owner. 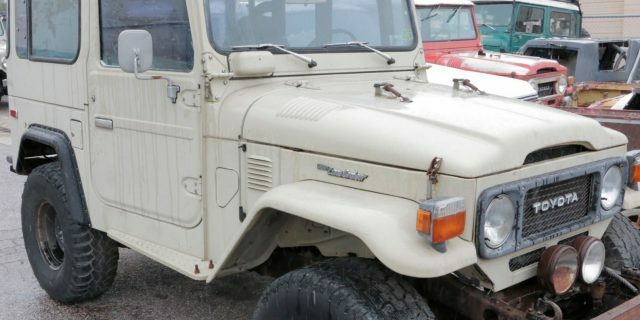 If you’re looking for a dependable, completely restored, show-quality, rugged and dependable Toyota Land Cruiser FJ40 that can conquer any trail or terrain, this is the one! No sacrifices were made during the restoration and crafting of this beautiful, head-turning rig! 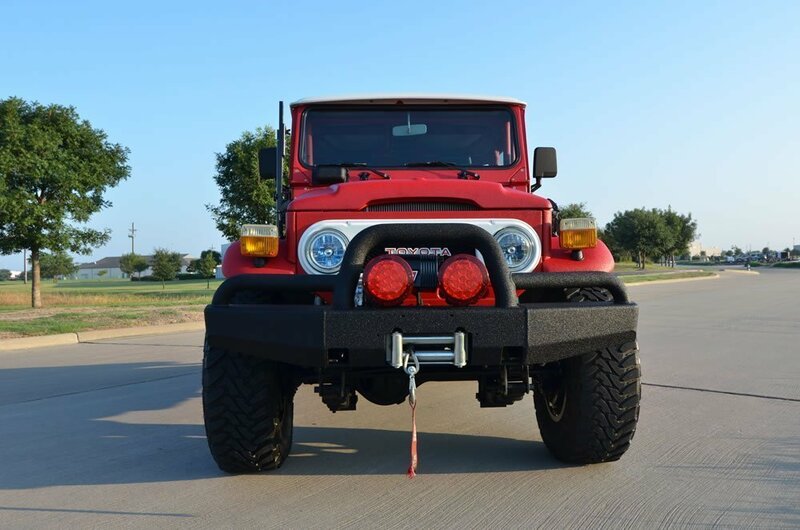 Some of the key features of this FJ40 include the completely rebuilt 2F engine with electronic fuel injection and a brand new Toyota 5-speed manual transmission (H55). 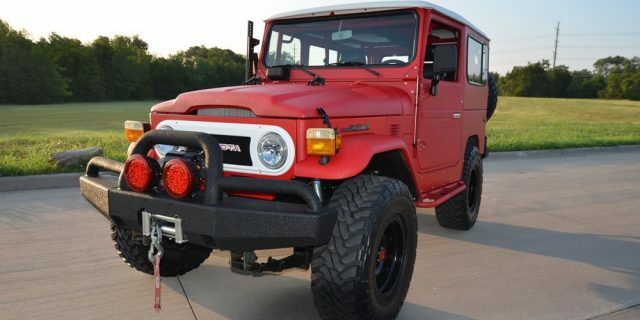 This go-anywhere, do-anything, classic FJ40 has tasteful upgrades while remaining very original. For those of you in humid climates concerned about rust, this is a perfect choice for you for two reasons: 1) The body was in pristine, rust-free condition before the restoration was started and 2) The LineX paint job, both inside and out, ensures an air-tight bond against the metal, which will give you confidence that your Land Cruiser will remain rust-free for decades to come, no matter what you throw at it or how humid the climate! Warn M8274 winch is time-period correct and is a complete winching freak of nature. 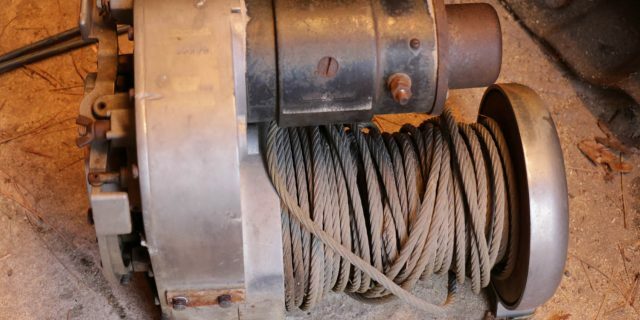 This winch will pull at 7 feet per second and is the most reliable and time-tested winch of all time. Upgraded brakes with larger pads to ensure firm braking on larger wheels. Disc brakes both front and rear. ARB front and rear air lockers give you ridiculous grip and torque. You’ll be confident hitting any trail, mudhole, or stream with this set up! Removable Marine carpet with sound insulation throughout cabin means you can actually enjoy a conversation while driving and your Cruiser will remain cool or warm with the added insulation. Marine carpet ensures those river crossings won’t be an issue as it dries fast and provides quick drainage and easy clean-up. Has not been offroaded – this rig was restored and has been babied and garaged ever since (take a look at the other vintage cars in the owner’s garage and you’ll get a sense of the quality and investment in this rig). It’s ready to rock the trails by a new owner! Iron Man 2″ lift and 33×12.50×17 Toyo mud tires gives you plenty of clearance and traction for the toughest trails out there! LineX spray in headliner – never have a sagging headliner again! Long story short: This FJ-40 lacks nothing and needs nothing…except a new owner to appreciate it and hit the trails anywhere on the Earth!